"mom, are wet willies bad?" "YES! They are the leading cause of deafness in children your age because some dumb kid sticks his finger in your ear and punctures your eardrum and the doctor's can't fix an eardrum so you go deaf!" Yes.....I really did give Ada that explanation. And Yes.....I am fully prepared for the day she realizes I have lied to her over and over again in the interest of safety and an all-consuming love - beginning with explanations about Santa Claus and the Easter Bunny. This has nothing to do with this post or the dinner we hosted last Sunday. This is merely the latest in a string of rather odd questions coming from our eight year old. The things they pick up at school? .....sigh.....why can't they just stay little? Anyway, back to what I'm doing here. March dinner @Tate's came on the heels of the LdV Renaissance FAire. Crazy, I know. Two giant events in three days! I was nuts. But the RenFaire was a huge success and dinner went swimmingly and then I went to bed! WHEW! Some photos from the dinner follow. And I will get a few of these recipes up here soon. Especially my new favorite way to prepare cauliflower. Delicious. 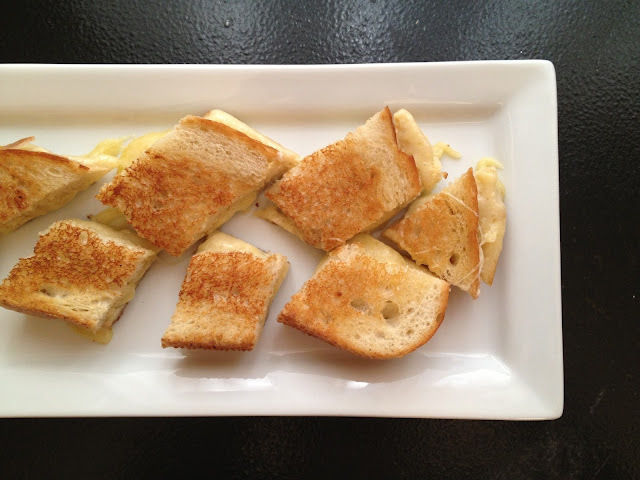 We started with these grown up grilled cheese bites. I know...a little heavy for a starter but they are SO good. I did serve the above after. Something nice and light right? 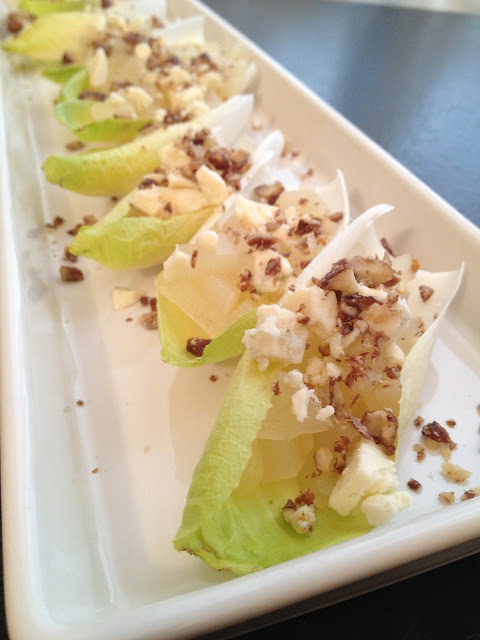 Endive with my canned pears, candied pecans and a sprinkling of Gorgonzola. Some fresh pepper. Empty platter! Next came this crazy mess of a salad. 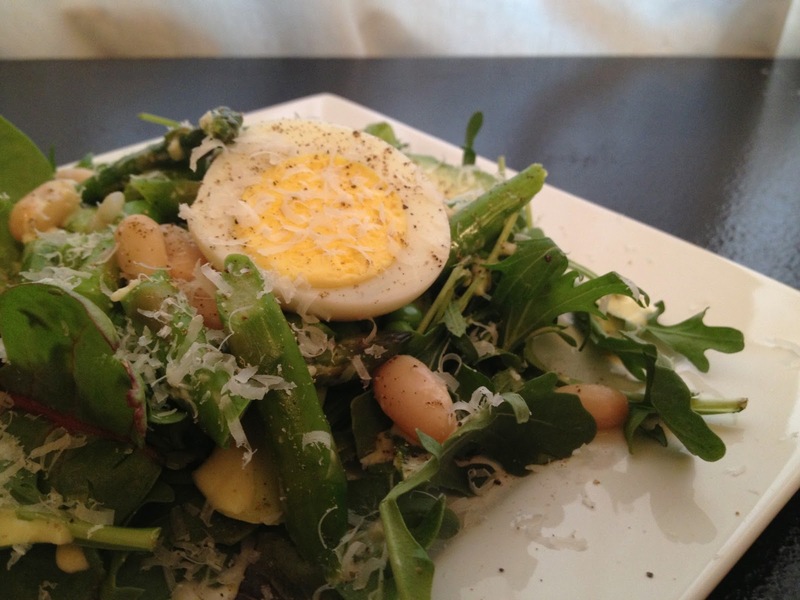 Arugula and mixed greens with blanched asparagus and peas. White beans. A gently hard-boiled egg. Pecorino cheese and the best buttermilk, pepper dressing ever! I think I've mentioned before that for presentation purposes one must tie the veal shanks. This was served with a saffron orzo and a horseradish gremolata. And my new favorite way to prepare cauliflower. 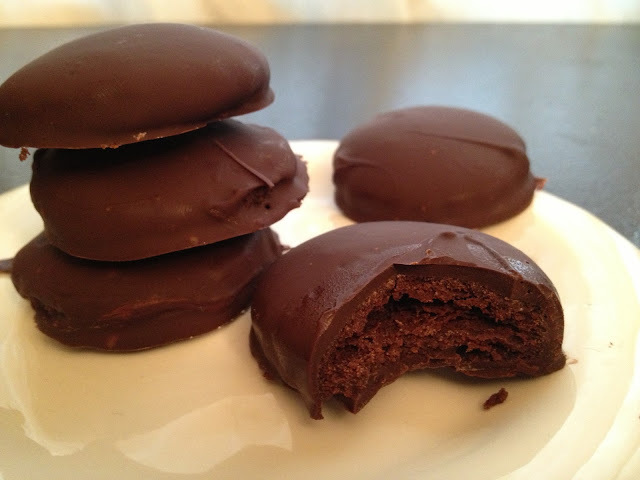 I made a Bailey's Irish Cream ice cream and served it with these homemade Thin Mint cookies. Thank you to the Girl Scouts for the inspiration to make my own. 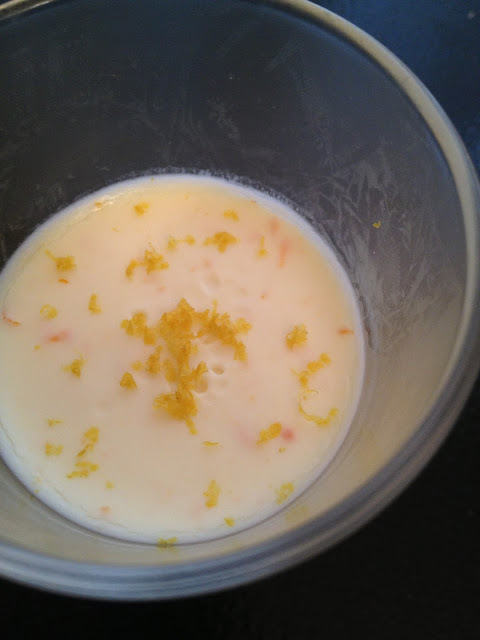 Then finally, we finished the evening with these citrus possets. Thank you Sarah for the reminder! Rich but light. Perfect finish. I will hopefully get many of these recipes up on this blog soon. A thousand thank you's to all the attendees. Look forward to seeing - and hearing - you all at our table again soon. HAHA! SO glad you Bake it With Booze ladies could join us! 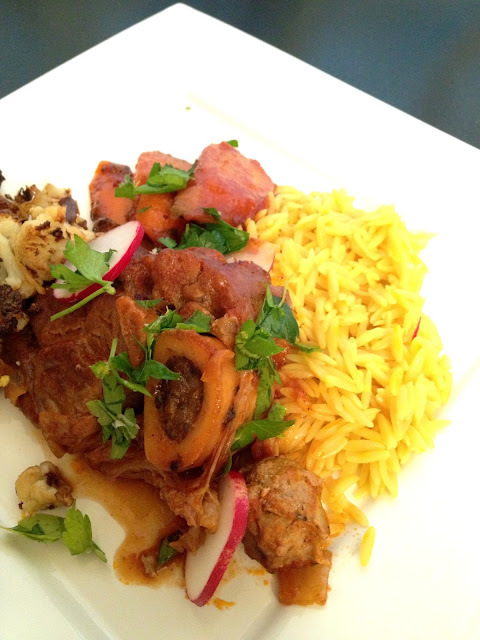 The osso bucco looks yummy! How did you cook the cauliflower? Roasted? Ally - oven roasted. SO good. I'll get that recipe up tonight or tomorrow.